The storage carousel that stores all of your containers in a convenient small space! Spin N Store Swirl Around Organizer Handle all your kitchen needs in the space you reserve for your coffee maker with the Storage Carousel. Never worry about fumbling with lids again with the same size locking lids. Containers fit on a spinning carousel to help you easily find your desired bowl. 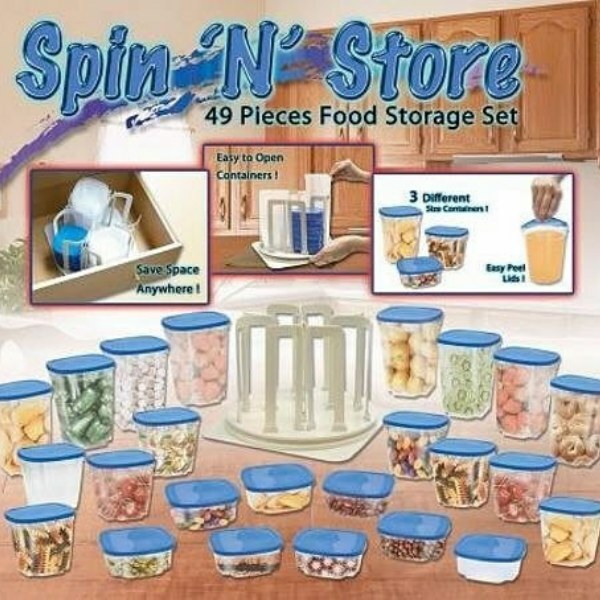 Features 8 - 8 oz Clear Containers, 8 - 16 oz Clear Containers, and 8 - 24 oz Clear Containers and 24 lids. Each bowl features measuring marks on the side. Bowls are constructed of FDA approved material, and are microwave safe. Features and Benefits: Clear Containers Make It Easy To See What Each One Holds Same Size Locking Lids, and makes it easy to find the right size lid every time!